The Great Social Reformer and the Architect of Modern Maharashtra, Rajarshi Shahu Maharaja established MARATHA EDUCATION SOCIETY in 1901 in order to cater to the needs of higher education to the socially and economically underprivileged classes of the society. Our society started its first boarding - Victoria Maratha Boarding House in the same year. It was followed by 24 Boarding's in quick succession and opened the doors of higher education to masses. In 1950, the society was renamed after Shri Shahu Chhatrapati Maratha Shikshan Sanstha and later on, in 1973 it was once again renamed as Shri Shahu Chhatrapati Shikshan Sanstha. 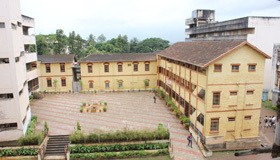 The Chhatrapati of Kolhapur is the Chief Patron and Ex-officer President of the Sanstha since its inception. The Governing Body of the Sanstha looks after the day-to-day management. Please Click here to see More Details..